Calgary Alberta had a very wet summer this year. So I thought I would take that idea and create “Miss Calgary Summer 2016″. 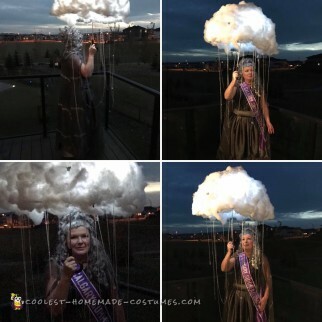 I made the storm cloud by stapling and gluing batting to a clear umbrella. Then, I added shimmery ribbon and crystals for the rain and mini strobe lights. I pieced the dress together from Goodwill and added tulle and a cape. We took pictures outside and neighbors stopped and applauded while dogs howled. Everyone who has seen this storm cloud and rain costume has loved it.